Datsun India today announced the launch of Remix Limited Edition of Datsun GO and GO+, priced at INR 4,21,000 and INR 4,99,000 respectively. With new hood & roof wraps, all black interiors and new dual-tone colour combinations, the Remix editions will be available at all Nissan and Datsun dealerships across-India starting today. 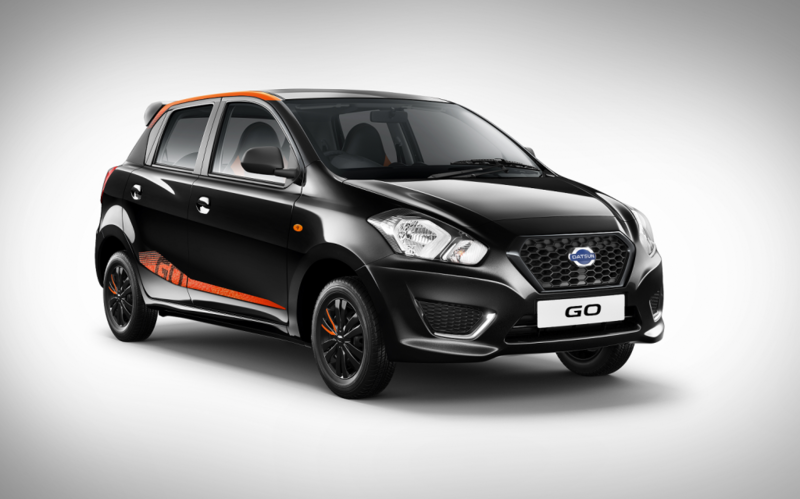 Styled with trendy exteriors, Datsun GO Remix has been introduced in an exclusive ONYX black colour remixed with attractive orange decals. 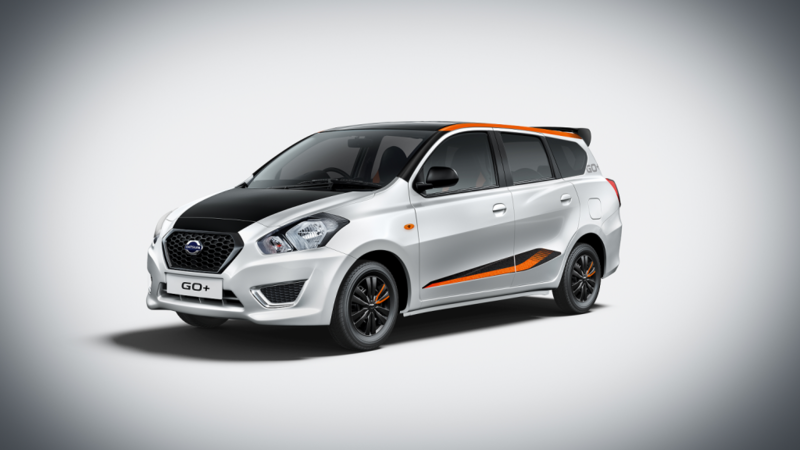 Also, the Datsun GO+ Remix comes in a dual-tone storm white color styled with exciting orange and black decals. The Datsun GO and GO+ Remix are also available in Storm White and Dual-tone Silver respectively. Remixed inside out, the limited edition models come with nine new features such as Remote Keyless entry, Hands-free Bluetooth audio, trendy seat cover, all black front grill, stylish black wheel covers, piano-black interiors, rear sporty spoiler, stylish chrome exhaust finisher and chrome bumper bezel. The Datsun GO and GO+ models are equipped with a powerful 1.2L engine. They both offer a robust performance, comfort, style and vigor to the consumers on the GO. The 5+2 seating of GO+ offers class leading spaciousness for an average Indian family at the best price in the industry. Both models are loaded with features like follow-me-home headlamps, speed sensitive electric power steering, powerful air conditioning, front power windows, auxiliary-in and USB charger ports, and central locking. . Both models come with a two year/unlimited kilometres warranty with Free Road Side Assistance. The warranty can be extended up to an industry-leading five-year/unlimited kilometres with Free Road Side Assistance, making Datsun the first manufacturer to provide unlimited mileage coverage under the extended warranty. TVS Motor Company, a leading manufacturer of two-wheelers and three-wheelers globally, today rolled out the new generation of the TVS Apache RTR 200 4V. Termed as Race Edition 2.0, the new Apache RTR 200 4V gets the advanced ‘Anti-Reverse Torque (A-RT) Slipper Clutch’ technology. The Apache RTR 200 4V Race Edition 2.0 will also sport new racing-inspired graphics, lending the motorcycle a dynamic and aggressive stance. The series now boasts of a fly-screen for enhanced aerodynamics. The TVS Apache RTR 200 4V Race Edition 2.0, is the first motorcycle in its class to be equipped with the advanced ‘A-RT Slipper Clutch’, a race-derived technology which is a testimony to the racing DNA of the RTR 200 4V engine. The ‘A-RT Slipper Clutch’ technology, accentuates the motorcycle’s performance, with 22% reduction in clutch force for quicker upshifts, enabling the rider to achieve better lap times. The technology also aims at ensuring rider safety in highspeed downshifts, avoids wheel-hopping while cornering, and improves vehicle stability with the back-balance torque limiter effect. With exciting racing performance on offer, the introduction of the Slipper Clutch in TVS Apache RTR 200 4V Race Edition 2.0, also promises sharp and precise gear shifts with minimal effort. The motorcycle continues to be powered by a 197.75cc single-cylinder motor which is mated to a 5-speed gearbox. The engine develops 20.5 PS (Carb) / 21.0 PS (EFI) of power at 8500 RPM and 18.1 Nm of torque at 7000 RPM. 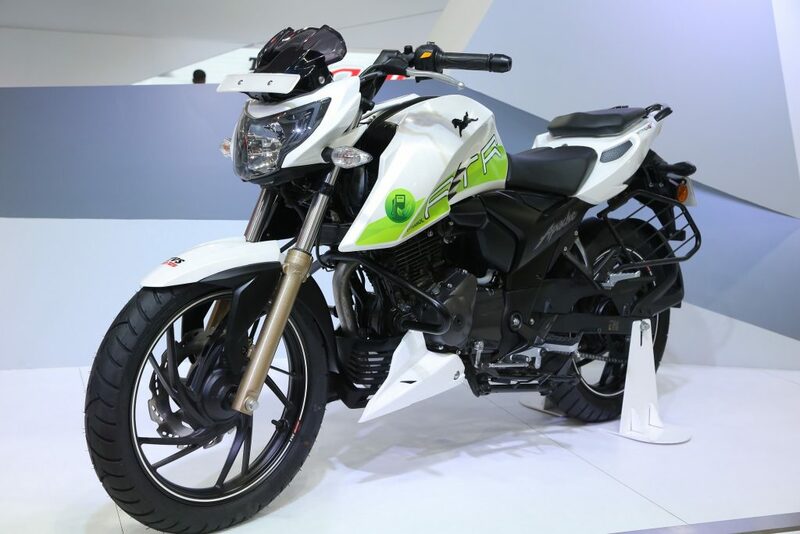 The new range of TVS Apache RTR 200 Series will be enabled with the ‘Anti-Reverse Torque (A-RT) Slipper Clutch’ technology and sport the new graphics along with the fly-screen. The TVS Apache RTR 200 4V Race Edition 2.0 will be available in Carburetor, EFI as well as Carburetor with ABS variant. Royal Enfield, the global leader in mid-size motorcycles, today introduced the Thunderbird X – a new factory-built, custom look motorcycle. Continuing the legacy of Thunderbird – India’s first definitive highway cruiser – the Thunderbird X will further advance the youthful character and the story of self-expression that the Thunderbird has come to define. 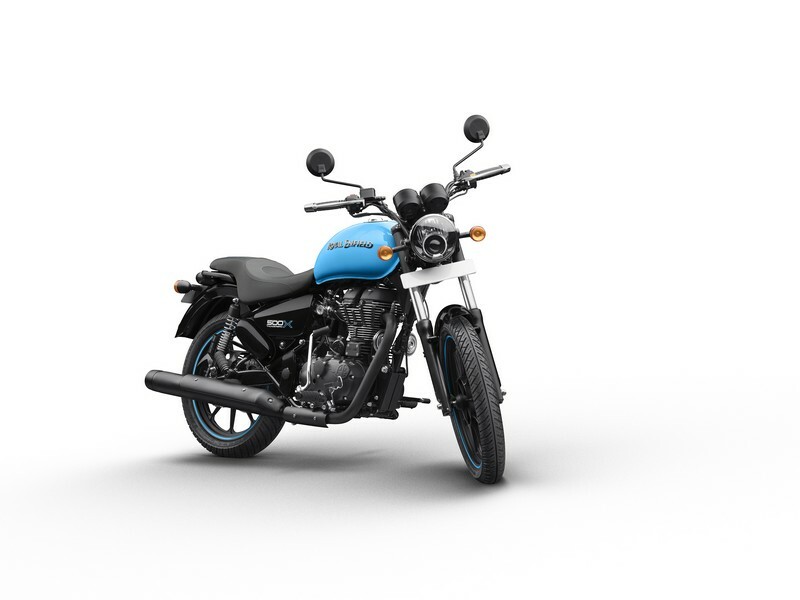 Bringing in a contemporary, custom-inspired urban expression with an all blacked out theme and vibrant colours, the Thunderbird X is bolder, and will sport four new colours – Getaway Orange and Drifter Blue for the Thunderbird 500X and Whimsical White and Roving Red for the Thunderbird 350X. Complementing the Thunderbird X motorcycles, Royal Enfield introduces a small Gear capsule celebrating the spirit of bold urban expressionists. Along with the Thunderbird 500X and 350X, Royal Enfield’s popular highway cruiser – Thunderbird will also continue to be retailed. Riding on the success of its Group brands in India, Piaggio India today launched the Aprilia SR 125, unveiled the Aprilia Storm and introduced an innovative smart mobile connectivity feature for Vespa and Aprilia scooters. With these unique offerings on display at Piaggio’s Pavilion at the Auto Expo 2018, Piaggio is growing its portfolio across segments to offer more possibilities, newer categories and unique technology innovations to patrons in India. Piaggio India’s 2-wheeler business witnessed accelerated growth in the year 2017 with the company’s innovative range of premium differentiated products seeing high traction across the country. With the latest introductions at the Auto Expo 2018, the company is aiming to further boost its India growth story and is complementing the same by rapidly growing its Motoplex format dealership to bring its products closer to customers across the geography. The Aprilia brand of racing DNA came to India 2-years ago to offer a Fun-riding experience through the first-of-its-kind category-creators, cross-overs, high performance, big wheeled scooters – SR 150 and Race. The testimony to these extraordinary product propositions was ‘Scooter of Year Awards’ received from some of the most reputed publications through the year. Today, the range gets extended with the Aprilia SR 125 which comes with a 125 cc, 3 valve engine, 14-inch big wheels and wider tyres continuing the Fun-riding experience. Its attractive exterior theme with new colours makes it a stunner while a longer seat and a raised grab handle deliver extra comfort to the rider as well as the pillion. Priced at Rs. 65,310/- ex showroom Pune, the Aprilia SR 125 will be available across Aprilia and Vespa dealerships in India. The Aprilia story continues with the Aprilia Storm, which is specially designed for the youth. The dynamic exterior theme with vibrant colours, 12-inch wheels with wide terrain tyres, high powered 125 cc engine and customisation through accessories makes it a unique experience from Aprilia to the Fun loving generation Z of today. In yet another category first to its credit, Piaggio launched a mobile connectivity app at the Auto Expo 2018 which will empower riders to operate and control features of Vespa and Aprilia through their mobile phones. To be available on the android and IOS platform soon, this smart feature can be installed by a simple download on the mobile phone, connecting the bike either manually or through a QR code. All the information related to the bike is stored on the feature and riders can find, navigate and follow their bikes using the smart connectivity app. It is also equipped with a panic alert feature, wherein riders can reach out to the registered number configured with the current location and ask for help in case of an emergency. Additionally, one can book a service on the app, locate nearby service stations, petrol pumps and connect with customer care executives. 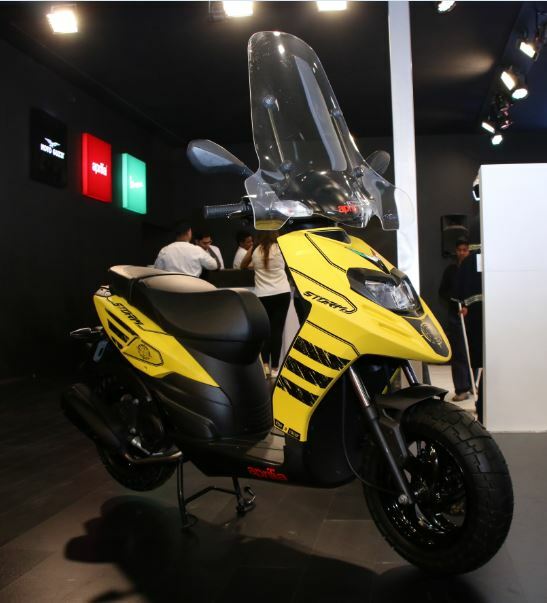 Also on display at the Piaggio Pavilion were Piaggio’s other global propositions such as Vespa GTS, Aprilia RS 150, Tuono 150 and its next generation technology offering, the Vespa Elettrica. At TVS Motor Company, innovation lies in anticipating future challenges and developing innovative technology at great value. Showcasing its vision of the future mobility solutions for the evolving two-wheeler rider, TVS Motor Company proudly presents TVS CREON. TVS CREON is a performance oriented, electric scooter concept, designed keeping in mind the global dream for a green future and uncompromised performance. This scooter concept is a testament to the fact that electric scooters can be both – exciting as well as environment friendly. 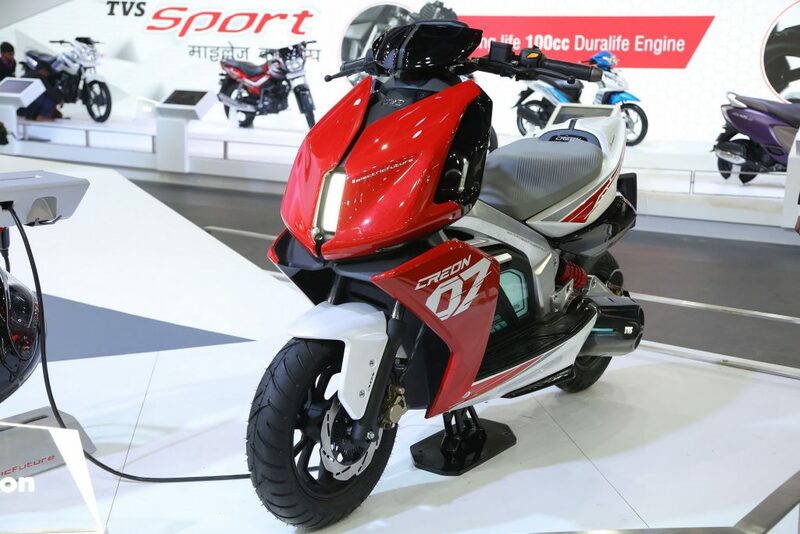 The TVS CREON features a next-generation electric motor that propels this scooter from 0 – 60 kmph in under 5.1 seconds and boasts of a range of 80 km. A rapid charging time of 60 minutes for 80% of full charge is on par with current generation smartphones, leaving little idle time while charging. The heart of the TVS CREON is powered by 3 state-of-the-art Li-ion batteries capable of delivering 12 kw of instantaneous power. The batteries have been specially designed to ensure high charge per volume of battery. This helps to keep the overall dimensions of the TVS CREON compact and maintain everyday practicality of usage. TVS CREON also gets futuristic smart connected technologies on board, which have been developed in collaboration with Intel. 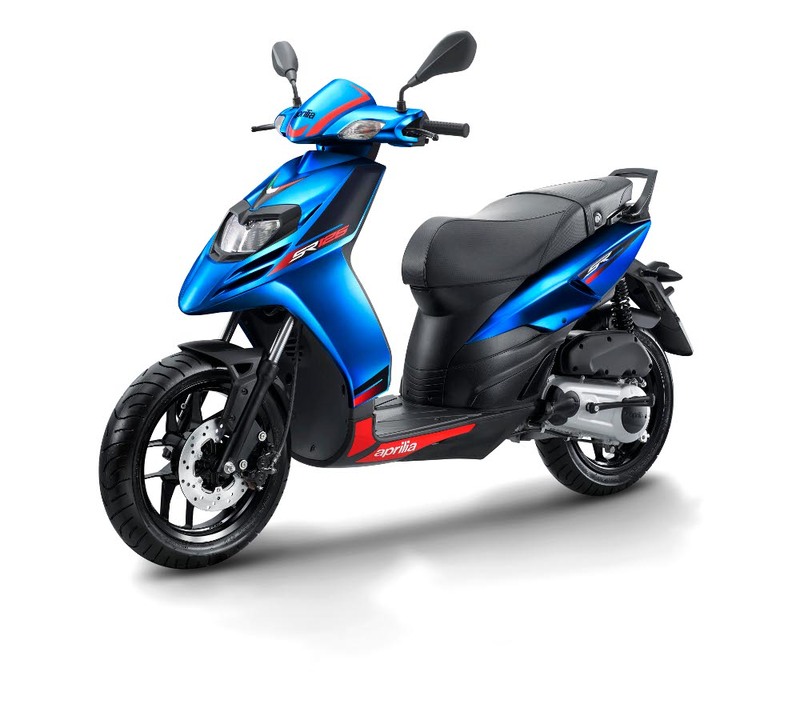 The scooter concept is equipped with a state-of-the-art TFT Screen which displays the speedometer, battery charge and, health status, tachometer, trip meter and odometer. The vehicle is app-enabled and offers a host of features including cloud connectivity, 3 custom riding modes, regenerative braking, park assist, safety, anti-theft, GPS & navigation, and geo-fencing. The TVS CREON also features an Aluminum lightweight perimeter frame, which provides the chassis stiffness and helps in improving the handling of the scooter. Diamond cut alloy wheels with wide section TVS Remora tubeless tires provide significant grip during cornering. The front and rear discs with single channel ABS in the front ensure safe and precise braking for all road conditions. The superior performance and sporty handling of the vehicle is achieved with advanced light-weight platform and optimized Centre of Gravity (CG) distribution. In terms of utility features, the scooter can secure a full-face helmet under the seat and is also equipped with a smart phone charger. TVS CREON is a showcase of the cutting-edge scooter technology from TVS Motor Company and sets the direction for the company towards a green and exciting future. 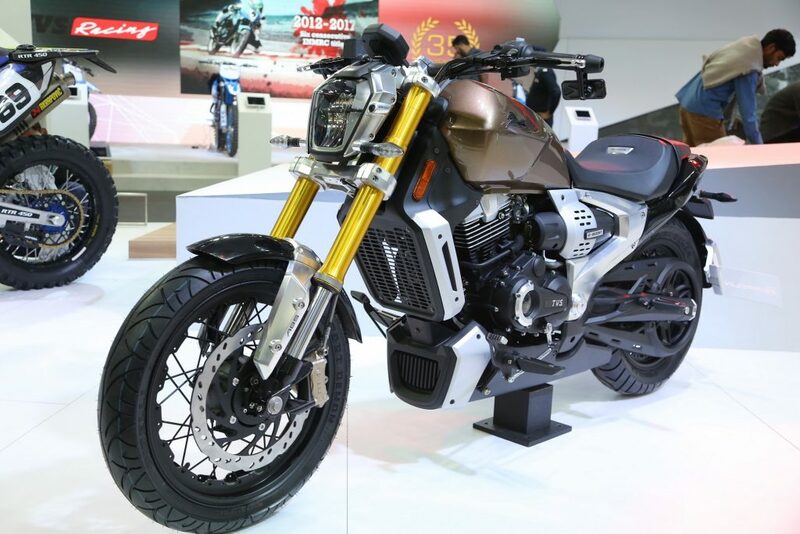 In the age of wanderlust filled ride goals, TVS Motor Company proudly presents TVS Zeppelin, a futuristic motorcycle cruiser concept. TVS Zeppelin is a performance cruiser motorcycle, sporting a raw metal look and feel. At the heart is a 220cc engine coupled with a one-of-its kind, TVS patented – Integrated Starter Generator (ISG). ISG comes with an e-boost option, which starts the motorcycle faster by giving it an augmented boost. This empowers the motorcycle with unmatched performance and best-in-class fuel efficiency. A 1200W regenerative assist motor with 48V Li-ION battery further adds to the powerful performance. Targeted at the new-age long distance rider, TVS Zeppelin is a sleek metal-bodied cruiser in a striking matte black finish with shades of rustic brown. The sleek ochre front forks, together with a compact head-lamp, make a distinct statement. The riding posture of TVS Zeppelin is aggressive yet comfortable, having two-up seat, lowered bars and feet forward highway pegs. The handling of the motorcycle is aided by lightweight tubeless spoked alloys, 41 mm USD forks, dual-channel Anti-Lock Braking System (ABS) and monoshocks. It’s silent belt drive provides an engaging ride with a dynamic cornering capability added to a superior braking performance. Complete with state-of-the-art features such as LED lighting system, first-in-class smart Bio-key, electronic speedometer, online connectivity, the TVS Zeppelin also hosts an integrated HD Action camera to capture your riding adventures on the go. TVS Zeppelin looks to be the new milestone in the world of cruising, where the power cruising and minimalist design blend seamlessly with cutting-edge technology. Ethanol is domestically produced from renewable plant sources. It is non-toxic, biodegradable and, safe to handle, store and transport. An oxygenated fuel that contains 35% oxygen, Ethanol reduces nitrogen oxide emissions from combustion. Apart from this, Ethanol as a fuel also helps reduce carbon monoxide emissions, particulate matter and sulphur-di-oxide. Use of Ethanol as a fuel will also reduce dependence on the import of petroleum and increase energy security. 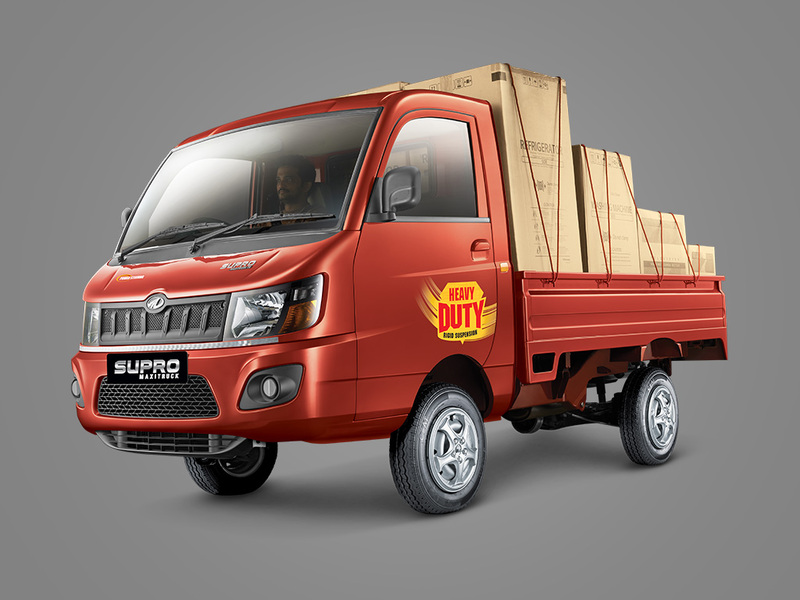 Mahindra & Mahindra Ltd., a part of the US $19 billion Mahindra Group, today launched the Supro Load Heavy Duty Series, which will be available on the company’s small commercial vehicle offerings, the Supro Maxitruck and Minitruck. The Heavy Duty Series will comprise a strong 8 leaf front suspension, strengthening Supro’s promise of delivering a superior value proposition to its customers. Priced competitively, the Supro Maxitruck Heavy Duty will cost Rs. 4.63 lac (BS4 Ex-showroom Mumbai) while the Supro Minitruck Heavy Duty Series will be available at Rs. 4.23 lac (BS4 Ex-showroom Mumbai). The Supro Maxitruck and Minitruck offerings are positioned as Mahindra’s ‘Profitrucks’ given the high load carrying capacity and the resultant, strong earning potential that these vehicles present. Since their launch in 2015, both trucks have set new standards in the market with their class leading features including superior power, mileage, cargo box size and payload. Built at Mahindra’s state-of-the-art plant in Chakan, Maharashtra, the Supro platform has undergone rigorous and full test cycle runs and has been validated on all performance, safety and reliability parameters. It also comes with a class-leading warranty of 2 years/60,000km (whichever is earlier) and will be available in attractive colour options of Diamond White, Deep Warm Blue and Lava Red. Mahindra has forged a deep relationship with its customers founded on trust which has been earned on the strength of the quality of its products, their robustness, earning potential, low maintenance cost and above all the reliability of brand Mahindra. The aim is to influence the customer’s life positively and all these enable the customer to progress in life, while building a long-term relationship with brand Mahindra. To add to this, the widespread Mahindra network of over 3,000 service centres and associates facilitates easy repair and service, which ensure peace of mind for customers. 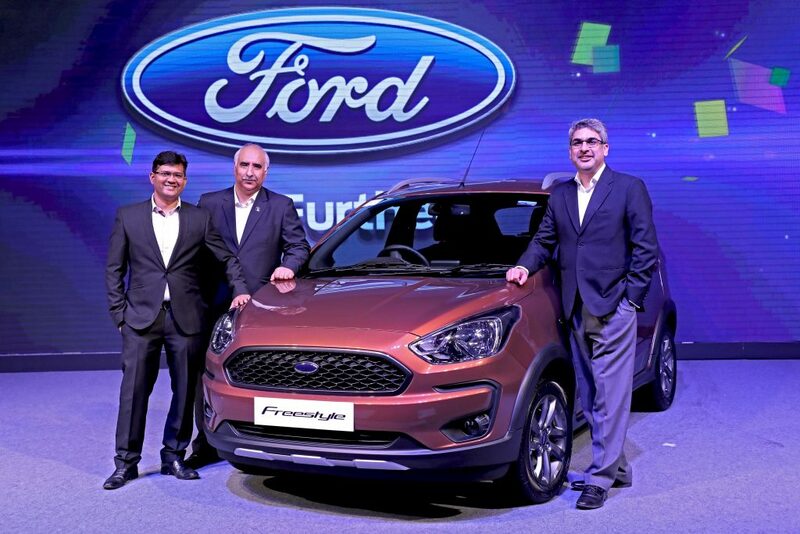 Ford today unveiled its latest global product offering – The All-New Ford Freestyle, a cool, capable & connected, compact utility vehicle (CUV) for Indian consumers. The all-new product from Ford combines SUV-like robust design, benchmark performance, innovative technologies and outstanding fuel efficiency – for greater choice to consumers in India and markets around the world. India will be amongst the first across the globe where the all-new Freestyle will go on sale in the second quarter of 2018. The all-new Freestyle will position Ford to address growing consumers demand for SUV-like vehicles. Such vehicles are being preferred owing to their commanding seating position & better ground clearance to tackle congested urban environment. Compact SUVs alone, a segment that Ford pioneered with the EcoSport, have consistently outpaced overall automotive sales in India, growing more than three-fold between 2013 and 2016. In 2017 alone, compact SUV sales in India grew 37% compared to 9% in total vehicle sales. “Just like we did with the EcoSport, we see a lot of potential in offering this compact utility vehicle to meet the SUV owning aspirations of first-time buyers or young achievers who are looking to upgrade their small cars,” Mehrotra added. The all-new Ford Freestyle embodies the aspirations of free-spirited buyers who are uninhibited and love to live life to the fullest. These consumers aren’t afraid to take their chances and are driven by passion. Their motto in life is to ‘Do Everything, & Regret Nothing’. “Freestyle is more than just an expression. This powerful word immediately encourages you to push the boundaries and do more, just like the product” said Rahul Gautam, vice president for Marketing at Ford India, said. Featuring a striking-look, and a commanding stance, the Ford Freestyle uses design elements common to more expensive mini SUVs. And it all begins with a unique grille with a dynamic, three-dimensional mesh. Sweeping straight lines moving from front to the rear give the Ford Freestyle robust, muscular, & SUV looks. The front bumper of the vehicle has an integrated skid plate and sculpted fascia sections, that create a protective full-width beam element, accentuating Freestyle’s SUV looks and credentials. The sculpted rear fascia conveys Freestyle’s athletic stance while precision detailing in the tail lamps ensure every colour is noticed distinctly. The blacked-out high contrast headlamps in Freestyle, complemented by fog lamp bezel, create an assertive and commanding expression. While an inclined windshield gives the vehicle a sleek, fast profile that communicates a high-end image. The Freestyle will come paired with Ford’s all-new, three-cylinder 1.2L TiVCT petrol engine that is small, light, strong and delivers outstanding fuel efficiency. The naturally aspirated engine will generate best-in-class 96 PS of peak power and 120 Nm of torque to deliver Ford’s fun-to-drive DNA. Consumers will continue to have a choice to opt for Ford’s trusted 1.5L TDCi diesel engine that generates class-leading 100 PS peak power and 215 Nm of torque. Freestyle will deliver sportier performance in all driving conditions and will feature a uniquely tuned suspension with increased track-width, high ground clearance, TCS, ABS with EBD and uniquely tuned EPAS among others. The Freestyle will continue Ford’s leadership on Safety, offering up to six airbags. With the introduction of Active Rollover Prevention (ARP), Freestyle is designed to perform safely in extreme situations, without compromising on the fun-to-drive elements. Combined with Electronic Stability Control, the ARP system will be able to automatically detect potential rollover situations by applying brakes to individual tyres and decrease engine torque. The Ford Freestyle will also feature Ford’s in-car infotainment system, SYNC 3 with a 6.5-inch touchscreen which allows drivers to control their entertainment and their connected smartphone with conversational voice commands. SYNC 3 system is also Apple CarPlay and Android Auto compatible. 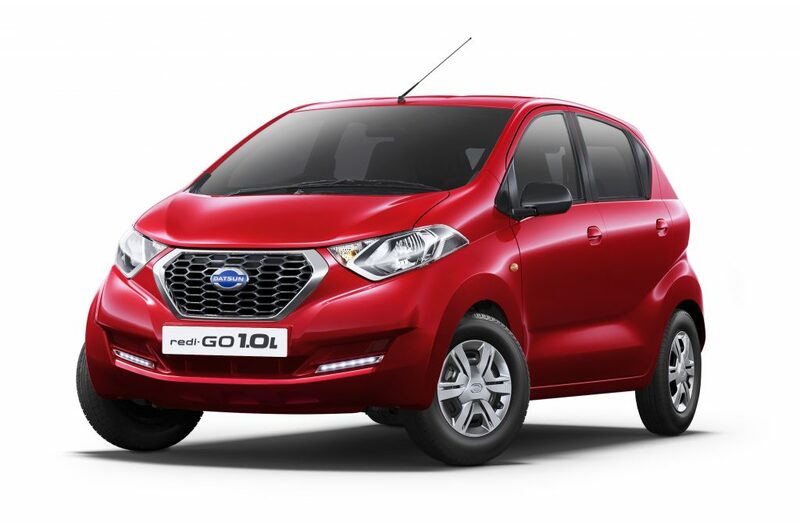 Datsun India today has announced the start of sales of Datsun redi-GO Smart Drive Auto at an introductory price of INR 3,80,600. Deliveries to new customers will begin from today across India. At INR 3,80,600 Datsun redi-GO Smart Drive Auto is the most feature rich AMT model in its segment. With the new Datsun redi-GO Smart Drive, Datsun also introduces new Bluetooth Audio System (with hands-free calling and Audio Streaming) across its range of redi-GO model in T (O) and S grades. Datsun redi-GO Smart Drive Auto is powered by Intelligent Spark Automated Technology (iSAT), 1.0L three-cylinder fuel efficient engine, all black interiors, central locking system with remote key for convenience. The car is available in five colours: Ruby Red, Lime Green, White, Grey and Silver. Datsun customers also have access to ‘Datsun CARE’, a comprehensive service package for new customers of redi-GO that assures complete peace of mind by 100% coverage of parts and 24×7 road-side assistance. The Datsun CARE package covers not only scheduled services and their associated spare part costs, labour charges and taxes, but also other important value additions. These include replacement of brake and clutch components, replacement of wiper blades once a year, wheel alignment and balancing, extended warranty with road-side assistance, exterior washes and interior cleaning. Datsun Care is acceptable at all Nissan & Datsun network pan India will also be available for Datsun redi-GO Smart Drive Auto. Lohia Auto Industries, an automobile division of 700 crore Lohia Global will be launching series of products to increase its products portfolio with the launch of new CNG, diesel and electric vehicles. 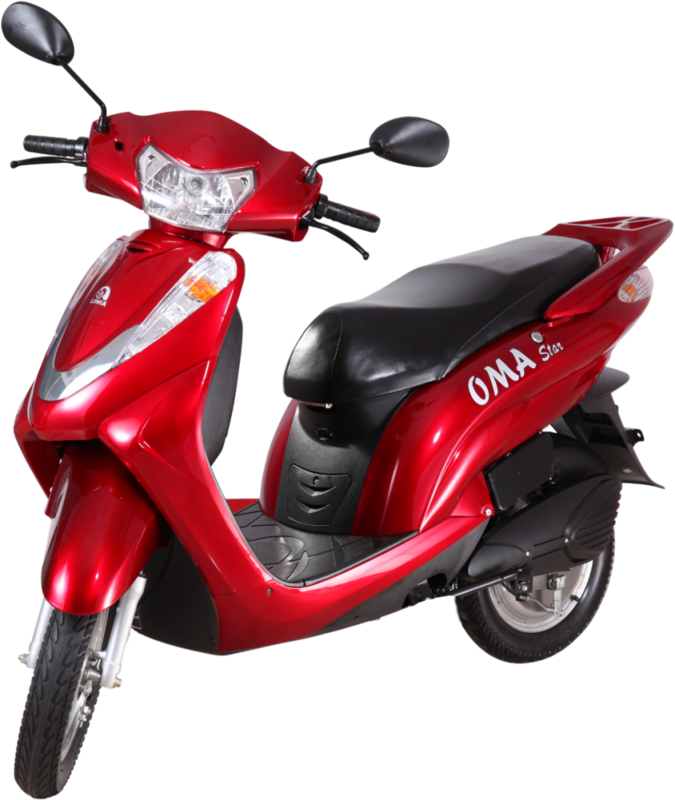 At present Lohia Auto manufactures Electric & Diesel vehicles comprises Two and Three Wheelers. The Company is planning to increase the numbers of product profilio from 10 to 15 by end of this fiscal with introducing new categories and variants in Diesel/Electric three wheelers. This leading electric vehicle manufacturer in India, is eyeing a turnover of Rs 500 crore in the next Two years. 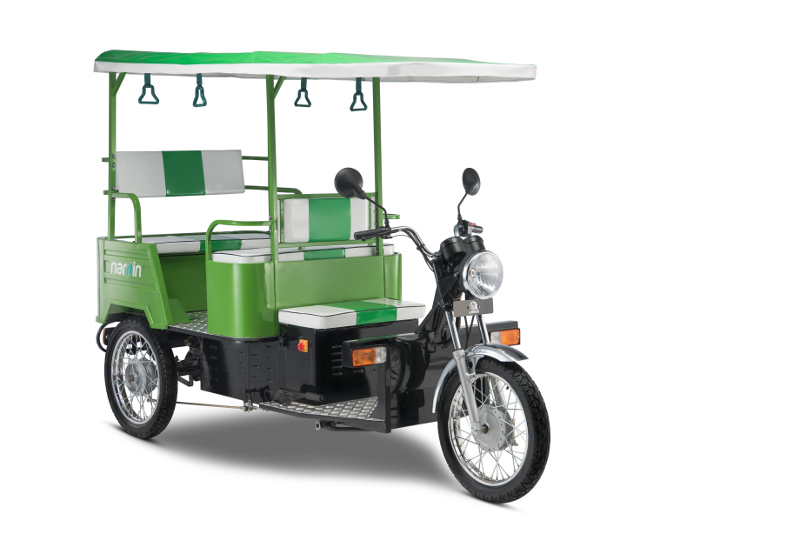 It has already lined up an investment of around Rs 10 crore for its CNG vehicles which is a completely new vertical to its current offering of vehicles which at present comprises of electric two wheeler, electric three wheelers and diesel-powered three-wheeler. “We are aiming to achieve a turnover of Rs. 500 from our auto division by 2020. Our current portfolio and new launches over the coming quarter will help us achieve this number and set the ball rolling” said, Mr Ayush Lohia, CEO Lohia Auto Industries. “Lohia Auto has marked its product expansion plans and launches on high priority as it will enable further growth for the company by tapping on new opportunity. The company plans to add a new CNG vertical and introduce new models of diesel and electric vehicles in the coming quarter. The new range of products will be equipped with the sector’s latest technology.” added Mr. Lohia. “Also the Electric vehicle segment has a huge potential. With recent initiatives such as quick pilot drafted by NITI Aayog, the sector is poised for growth. It will accelerate the acceptance and popularity of Electric Vehicles in the country. We want to tap into this opportunity by launching our new range of electric vehicles. With this not only will we create more demand and boost company’s sales but also reinforce the vision of the government of reducing crude oil consumption and cutting down carbon emissions. Also keeping up with the NEMMP‘s idea of introducing 6 million EVs on Indian roads within 6 years span. This will make India less needy for crude imports while also keeping a check on pollution.” further stated the CEO of Lohia Auto Industries. To increase its manufacturing capacity, the company is also planning to set up new state of art plant in one of the states in southern or western India. Moreover the new plant will also boost the company’s presence, reduce logistics time and cost. With an investment of over INR 100 Crore, the new plant will be equipped with the sector’s latest technology. Proposals and plans are already being invited for exploring some good options for setting up the second plant in this region. “With the new state of art plant the production capacity could be further enhanced to around One lakh two-wheeler units and about 60 thousand three-wheelers.